April 2009 It's hard to believe that a whole year has passed since the beast first received its Australian certificate of airworthiness. Along with this anniversary, DZY's annual inspection also fell due. Over the past year, I didn't get to fly the bird as much as I wanted. Owing to unsuitable flying weather on weekends (week days tended to have good weather), I ended up putting about 20 hours on the clock in 12 months. Anyway, I decided to keep a photographic record of the annual inspection for posterity. 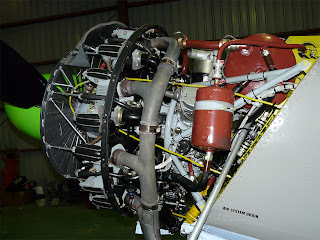 First the engine cowlings were removed and 18 spark plugs pulled for inspection and cleaning. Then each cylinder was compression tested. Happily, all cylinders returned between 74-78 psi for an input pressure of 80 psi. 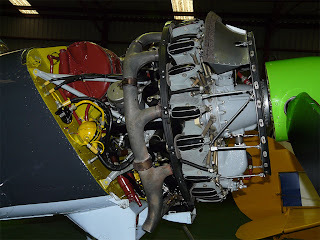 Various aircraft systems are coded with different colours. eg oil tanks and pipes are painted brown. 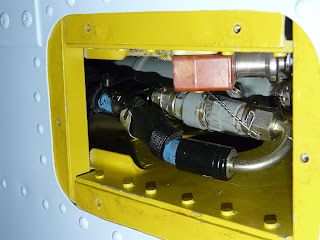 The fuel tanks and pipes are painted yellow, and the air bottles and pipes are painted black. 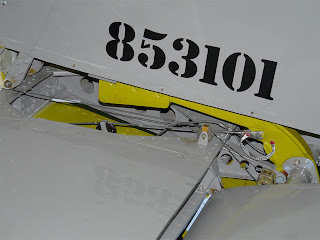 The underside wing root panels were removed for inspection of the wing attachment joints. Note the massive size of the front spar attachments. After this photo was taken, the oil spots were cleaned off to avoid staining the light blue paint. 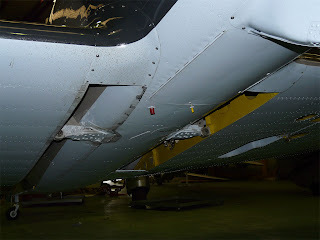 Here, the underwing access panel has been removed to inspect the aileron control rods and bell cranks. Although not readily apparent in this photo, the aileron control rod is a hefty 2.5 cm in diameter. 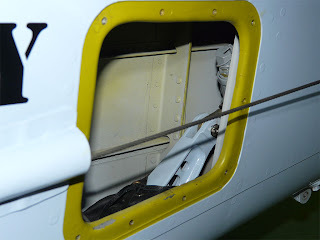 With the access panel removed, a landing gear system air hose showed signs of wear. Close examination suggested the air hose was being pushed against the wing stringer (immediately left of the wear point) when the landing gear retracted. The solution is to replace the hose with one slightly longer and slightly rotating the hose coupling anti-clockwise to move the hose further away from the stringer. This shows the elevator and elevator trim control system. The massive greenish-yellow arm and weight at the end of it, is the elevator mass balance. Concealed inside the horizontal/vertical fin attachment area, the mass balance is used to alter the structural resonance frequency of the elevator for flutter prevention purposes. 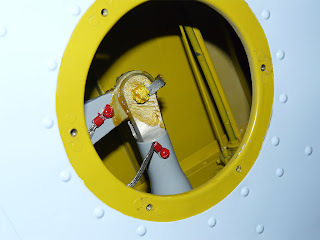 With the tailwheel access panel removed, the gas-oil shock absorber (attached to the tail skid arm) can just be seen along the right edge of the access hole. Yak UK - get your own Yak here! Fly Better - excellent free books!